Ollie: Can I chase it? Rosie: Can I lick it? Harold: Can I eat it? Me: Can I write about it? 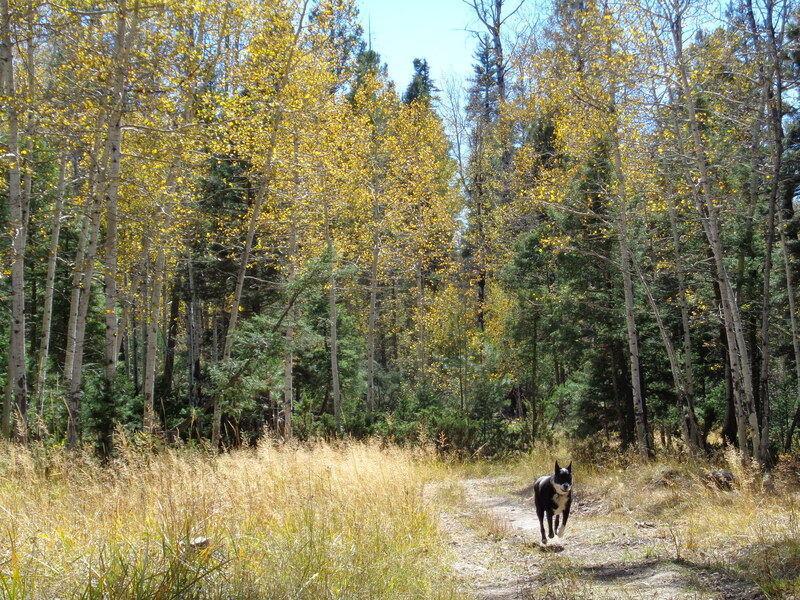 Given these four personalities, I’d say that this quick trip to the Jemez Mtns was a success. I’d had a itch to camp atleast one more time before the nights are too wicked cold. Mid October at this altitude is risky weather wise. Last year at this time I drove to Sugarite State Park and it rained, hailed and even snowed briefly during the night, so cold that Ollie shook under the covers and all three dogs cuddled close in the back of the 4Runner. I thought I was more prepared this time. I wasn’t! I discovered that I’d forgotten plate, mug, bowl, coffee filters and toothbrush. I must remember to check the list before I leave home. We threw the black camping box in the back, tore off the blankets and covers from my bed, packed a small cooler and headed out for the mountains. 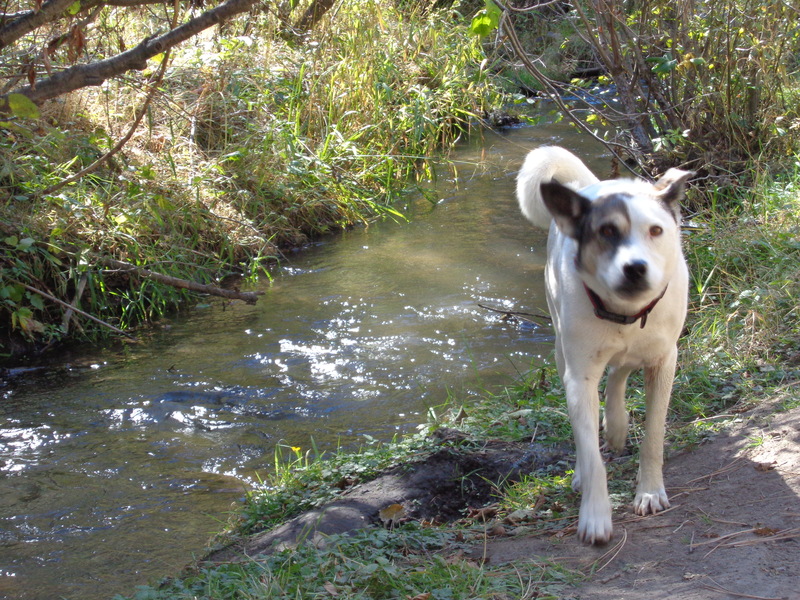 We took a couple of pitstops on the way but I craved the Jemez Creek and that became the first stretching of legs. Highway 4 heads up from San Ysidro on Hwy 550 that takes you to Farmington area. 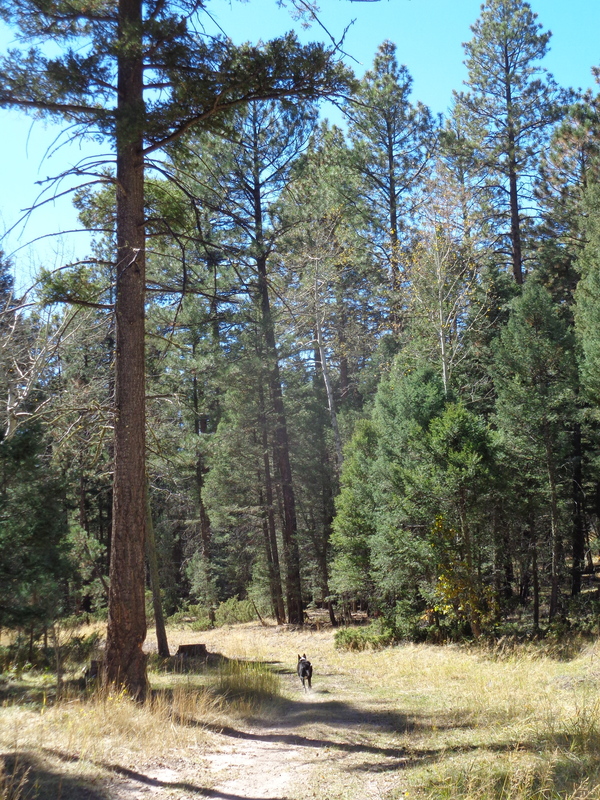 A little past the Jemez Peublo village, there are NF fishing access and picnic areas on the river. We took our time and the dogs ran free. Rosie paddled. Harold hangs over the edge, scared of falling in. Up the hill a few miles is the turn-off for NF road 376 which takes you through the Gilman Tunnels. I carried on the paved Highway 4 instead, keen to get to Fenton Lake State Park. I hadn’t been there for five years or more and had a vague memory of another small lake within a thick woodland, somewhat like Morphy Lake. The water sparkled, the entrance fee was $5, and the place was busy. A Monday morning in October is the time for family fishing. I drove through, had a looksie, and headed back down hill past the road works. I’ll come back after I’ve done more research and bought myself that annual State Park pass for only $180. It’s on my list. A national forest road on the left, NF144, took my fancy. I wonder if I remembered it from my obsessive map-reading? 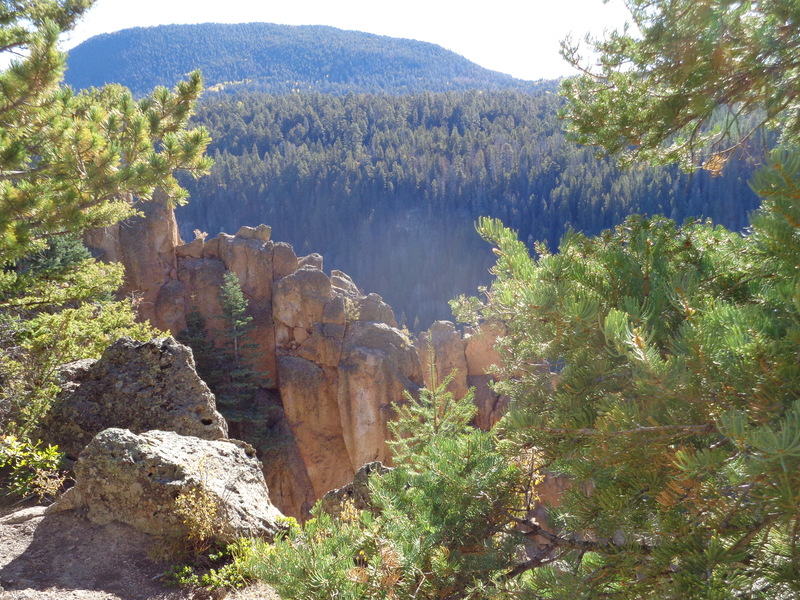 The dirt road quickly took us deep into the mountains, canyons, and thick ponderosas. I pulled off at an obvious dispersed campsite a mile in. I let the dogs out. A meadow, campfire, shade, and a closed off road into the hills, this was perfect. I pulled out the camping box, the three dog beds, and two folding chairs… yes, I bring two and set them up around the fire-pit, cups and books beside each one. I figure I’m less likely to get any unwanted attention if it looks like two people and three dogs are camped there. We hiked and walked and dogs played and I sat on the grass and drank a beer. We repeated this three times one afternoon and twice in the morning. 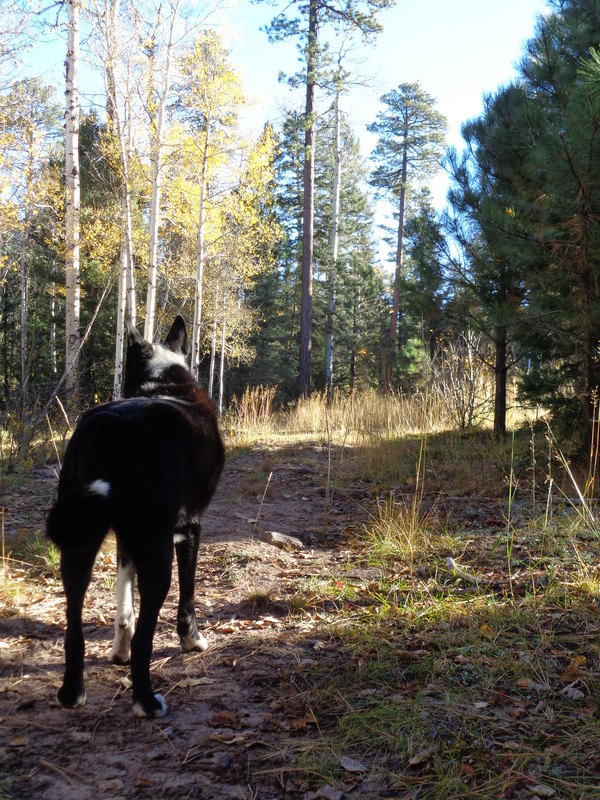 I couldn’t stop smiling at the perfect weather, sunshine, Aspens’ golden leaves, and life on the whole. The beer was chilled too. 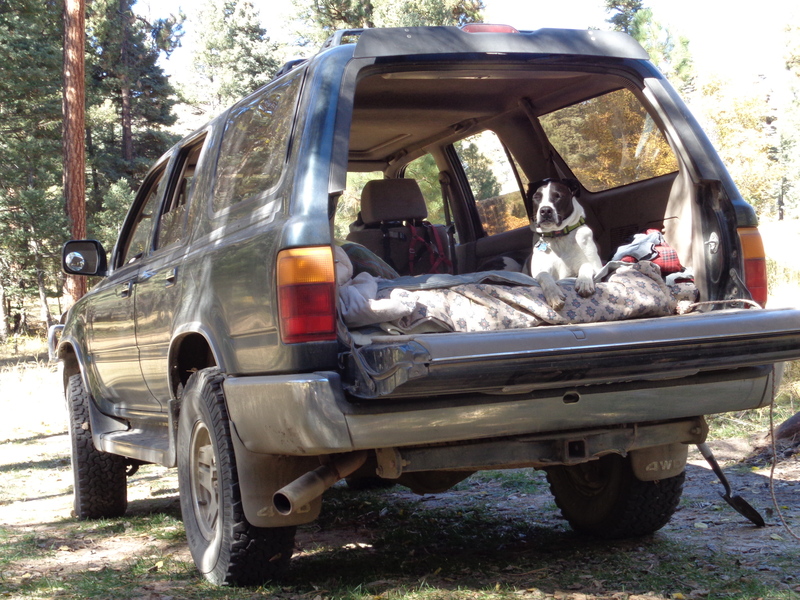 The day passed quickly, a fire kept me warm and the dogs pre-heated my bed in the truck. In the morning, I decided we’d head further north and west on these roads. It looked like NF 144 would circle around to the east but that I could take NF 315 west towards 126 and Cuba, NM. Cuba has a gas station on the north side of town with the best homemade burritos I’ve had. The road quickly narrowed as it climbed. 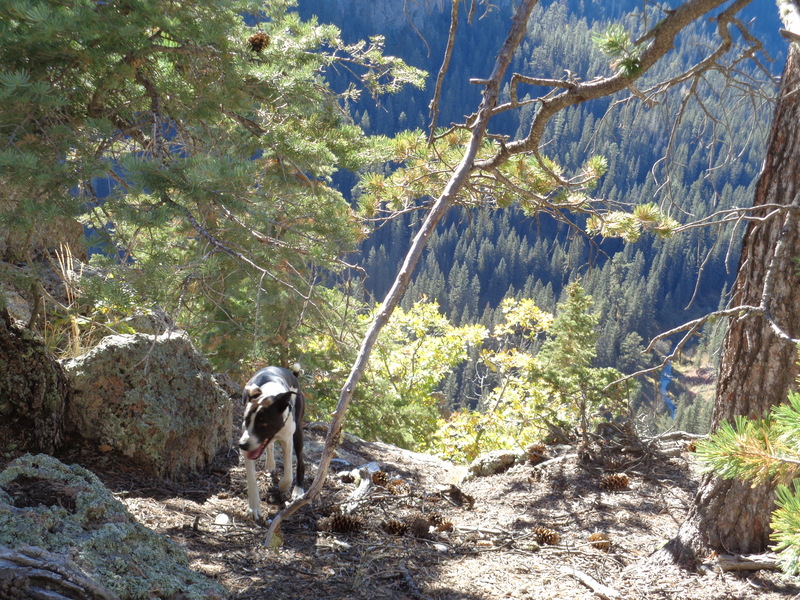 I stopped at one overlook and quickly panicked that the dogs would chase a squirrel over the edge and fall thousands of feet into the canyon below. We drove on. After taking some photos. 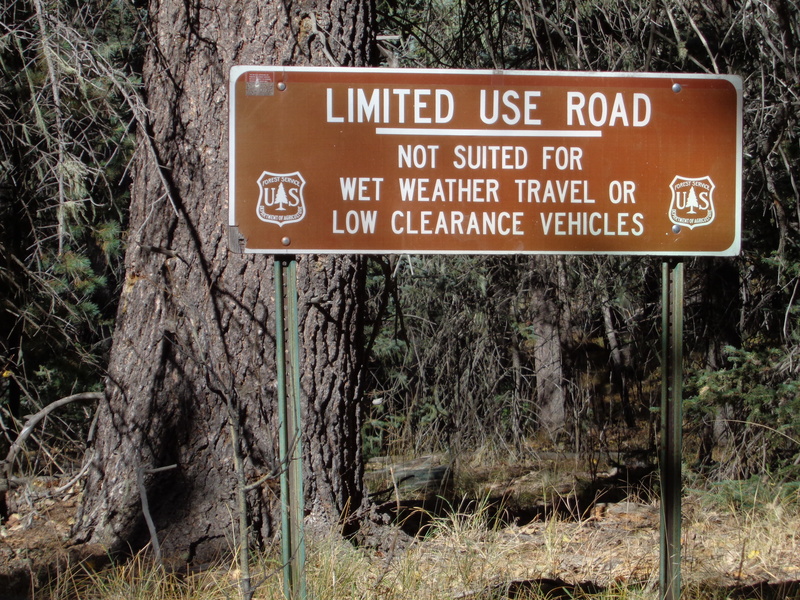 The sign said that the road ahead was Limited Use, not for wet-weather and only high clearance. It was a sunny day and the 4Runner has good clearance and big tires. I drove on. Apparently those ranger’s signs mean, don’t drive down here unless you have a 4×4 short wheel base, lifted, locked AND you know what to do. My mistake. 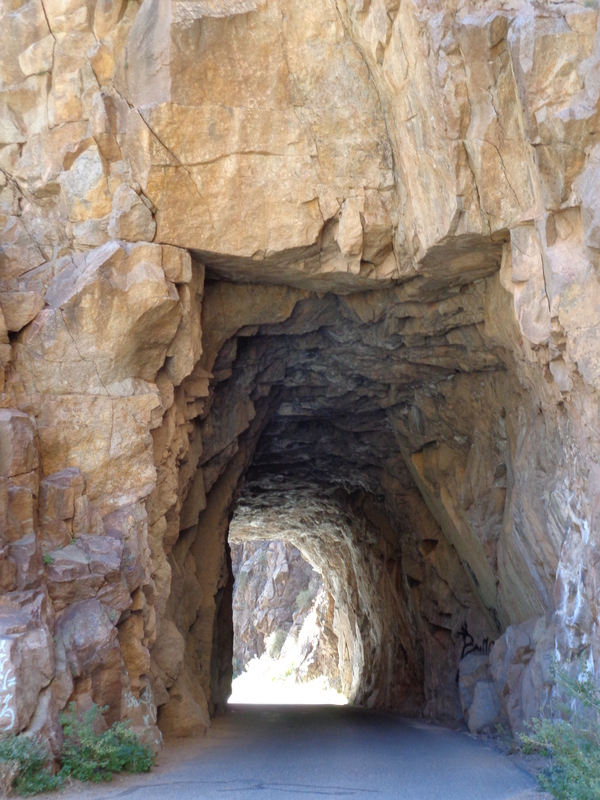 The road became rocky, sandy, narrow, huge drop offs, no turning around. I kept on. A tree blocked the road. I stopped the truck and walked down. Yes, there was a way around the tree, through a thick bed of sand, but why? I had a sick stomach, and no back-up plans. I walked back to Faith The 4Runner and got the dogs to lie down so I could see out the windows on this hillside. A five point turn, and we slowly drove back up the way we came. 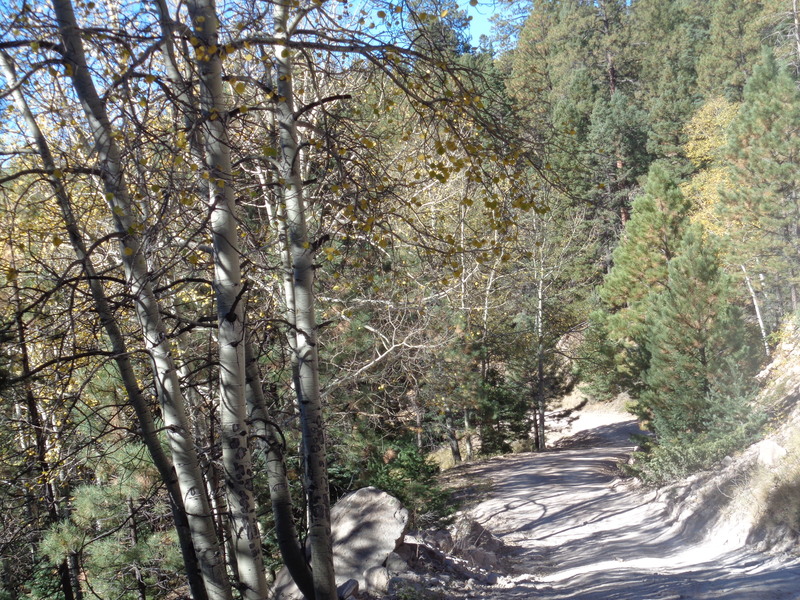 Heading back down Hwy 126 towards Jemez Springs, I turned south on NF 376, a familiar graded easy dirt road. My stomach rumbled. The dogs hung out the windows. 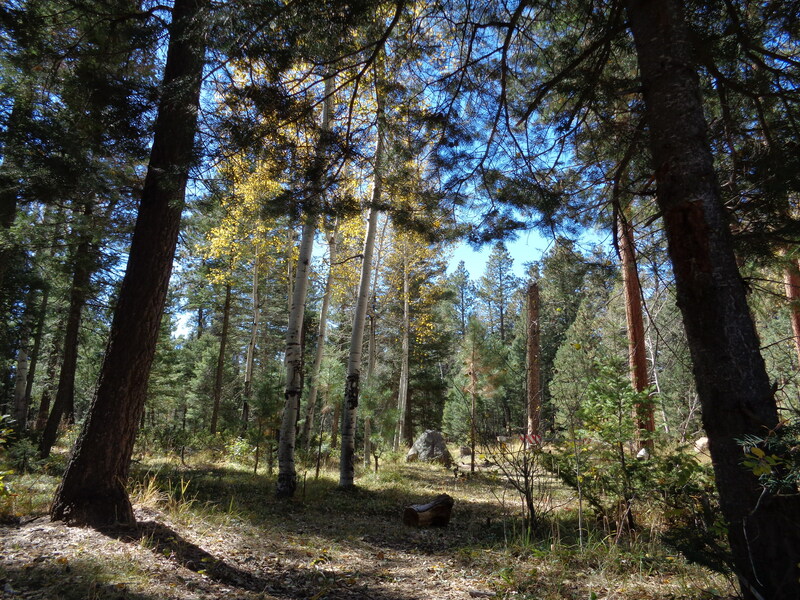 I pulled over at another campsite next to the Jemez Creek. They played. I heated corn tortillas, cheese, and green chile. We even got to drive through the Gilman Tunnels after all. They’d been built in 1924 by the Santa Fe Northern Railway for hauling lumber out of the mountains but after the Wall Street Crash, the SFNR never fully recovered and the railway stopped running in 1941. The first time I drove up here this May 2015 I had no idea. I came around the corner and suddenly saw these beautiful short incredible to think about tunnels. The canyon drops off to the side with the Rio Guadalupe flowing fast far below. Beautiful. Yep, it was a successful trip. I get scared taking some of these roads but I know I’d regret it if I didn’t, if I’d stayed home instead. You see, I read maps, I read others’ trip reports, and I’m inspired. Always have been, even as a kid in the back of the Land Rover crossing Europe with my family, I read the maps and asked questions constantly then filled my scrapbooks with photos and stories. Somethings don’t change.